Thrifting has been getting more popular in recent years. I now have the convenience of a church run thrift store right in my neighborhood strip mall. One Saturday a month they have a one-half-off sale, and I can get clothes for much less than at Goodwill. One drawback is there isn’t a changing room at this store. I saw a full skirt that I liked but I thought it might be too small at the waist for me. I bought it anyway! It sat on the sewing pile for too long when I could have been wearing it this summer. It had a lining and an invisible zipper at the side. 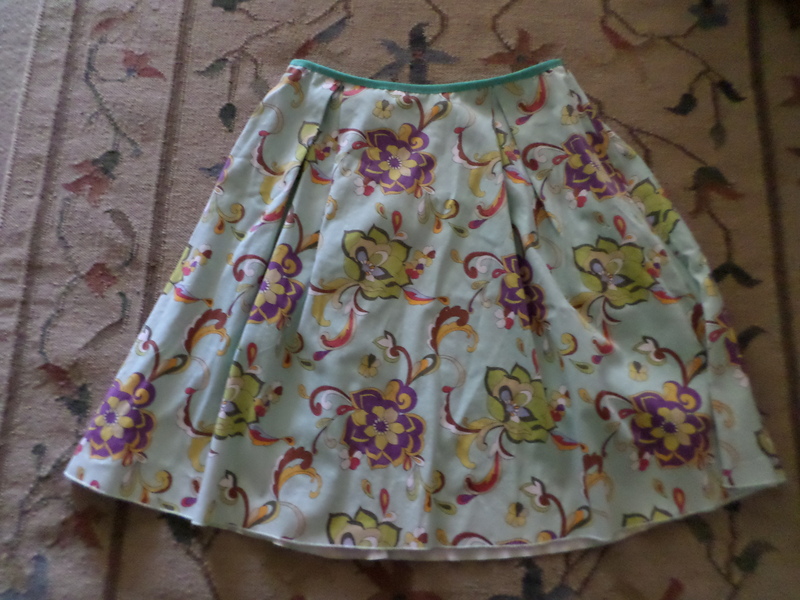 What I did is an easy fix for a skirt that’s too tight at the waist but has a little extra length. I removed the zipper and the waistband. I was left with a skirt with four pleats. 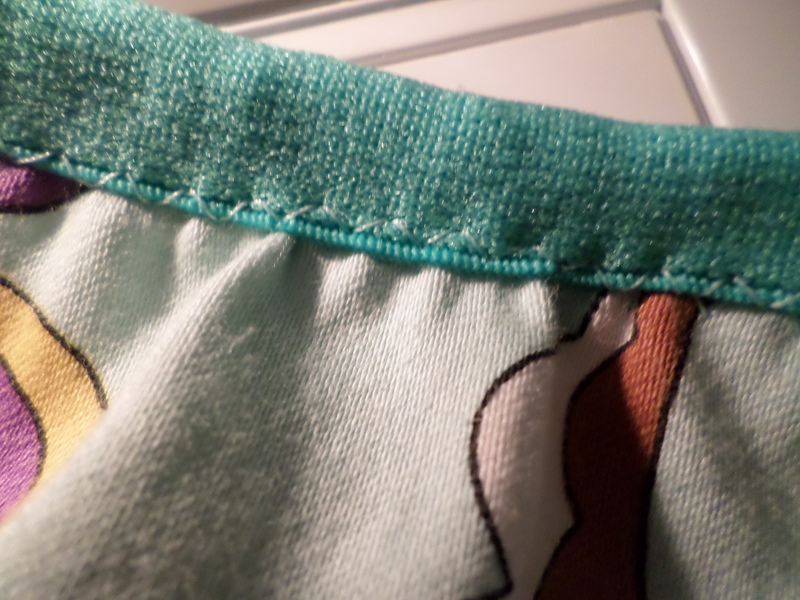 I reinserted the invisible zipper and then used foldover elastic for a new waistband. I looked up tips on sewing with foldover elastic. I found this post and video on Disparate Disciplines to be the most helpful. 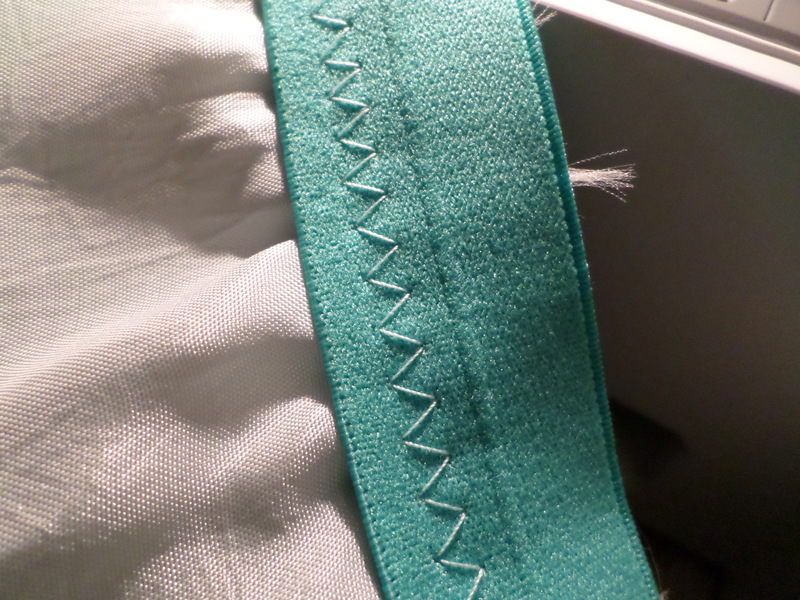 I followed the tip to sew the elastic to the wrong side first with a big wide zig-zag, and then fold over and sew the elastic down on the right side with a narrow inconspicuous zig-zag stitch close to the end of the elastic. You have to stretch the elastic while sewing. How much you stretch it determines whether the fabric is flat or gathered. After taking off the waistband, the waist was too large so I stretched the elastic quite a bit, but I should have narrowed the waist seams as well first. I added a hook to the elastic above the zipper to snug it up a bit more. 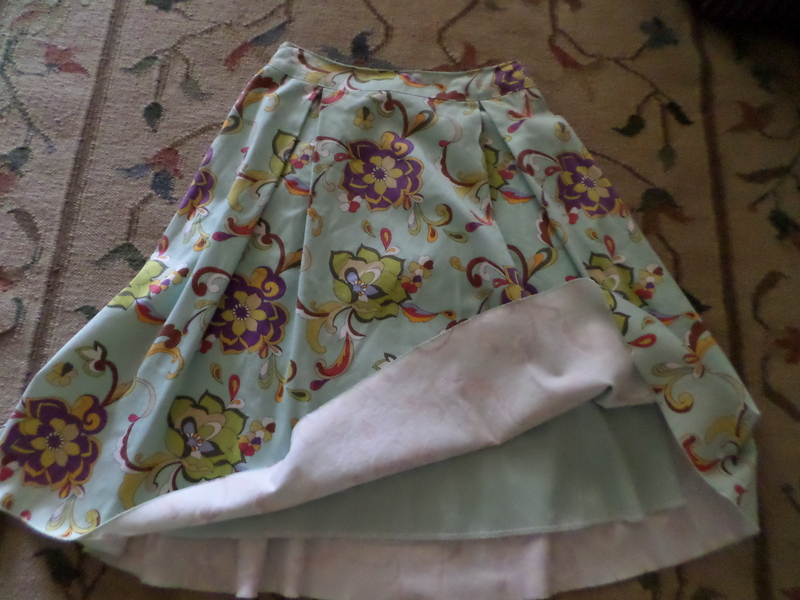 When I sewed the elastic to the skirt I also included the lining. Afterwards, I went to the table to get a needle from my new handmade strawberry needlebook to hand sew the lining to the zipper. I frantically searched and searched for days but no needlebook! How ironic given that I was happy that all my favorite needles had a secure home of their own. I last had it when I was taking more photos of it, and probably put it down on the sofa as I was taking other photos. I cast a suspicious eye on the four- legged inhabitant of the house thinking he might have grabbed the soft squishy “toy” when my attention was elsewhere. I even looked outside behind shrubs but never found a trace of it or any needles. Foldover elastic is an easy option for a waistband, similar to a bias tape waistband but with more stretch. I’m happy with my altered skirt and I’ll definitely be using this technique again. 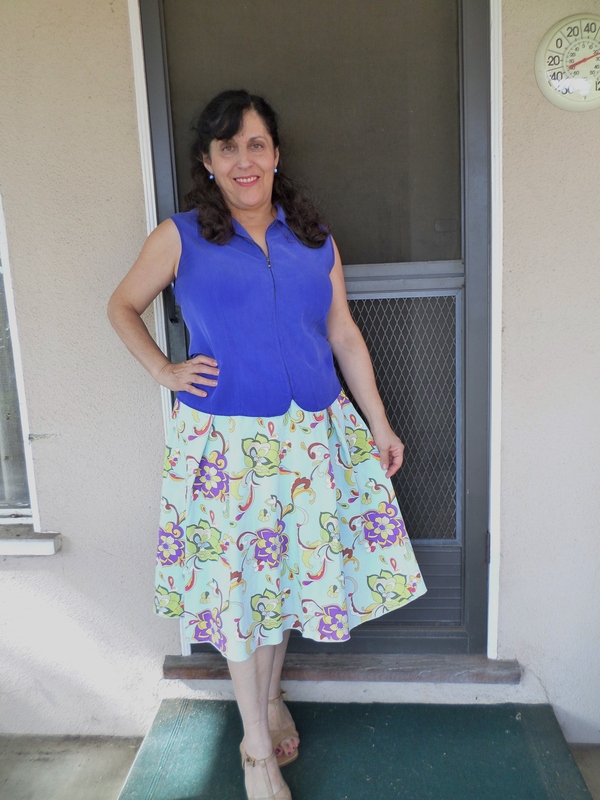 This entry was posted in Refashions, Sewing, Thrifting and tagged enlarging too tight skirt, foldover elastic, foldover elastic for skirt, foldover elastic tips, skirt waistband, thrift clothes on November 29, 2013 by Stitch It Again. When I published my first post last year on October 28, 2012, I just jumped in and posted about a project I had finished. I had started to concentrate on learning to sew after mostly knitting for several years, and wanted to track my progress. First I decided which platform to use. Some of the blogs I regularly read are on WordPress.com, and one of the reasons I decided to use WordPress is because it’s easy to leave a comment on a WordPress blog. You don’t have to sign in with a Google, Facebook, or other identity, just a name and e-mail. Then I had to pick a name for the blog – should I try and come up with a name that is clever or unique? After some Google searches to find out which names were taken, I chose “Stitch It Again”. The common aspect of knitting, crocheting, embroidery, and sewing is that they all have stitches, and the “again” refers both to coming back to these crafts and also to my habit of redoing what I am working on until it meets with my satisfaction. Next I created my header using Mosaic Maker on Flickr Toys to show what projects had led me to the present day. Some of my favorite themes are fall themes and the two projects I am showcasing from my header both feature a leaf motif. 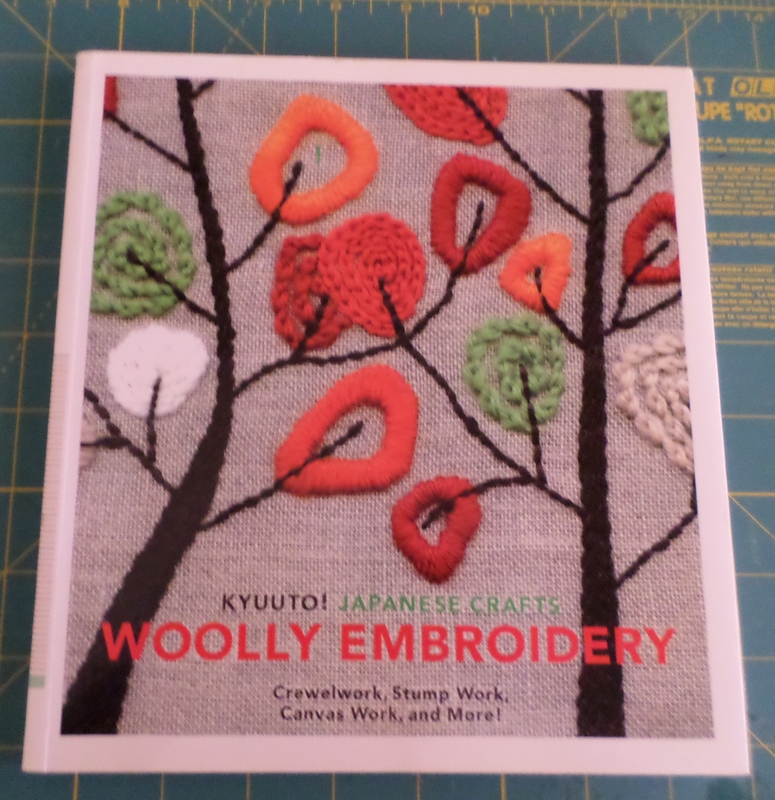 The wool embroidery is from a project on the cover of “Kyuuto! Japanese Crafts – Woolly Embroidery”. I made it as a wall hanging instead of a pillow. 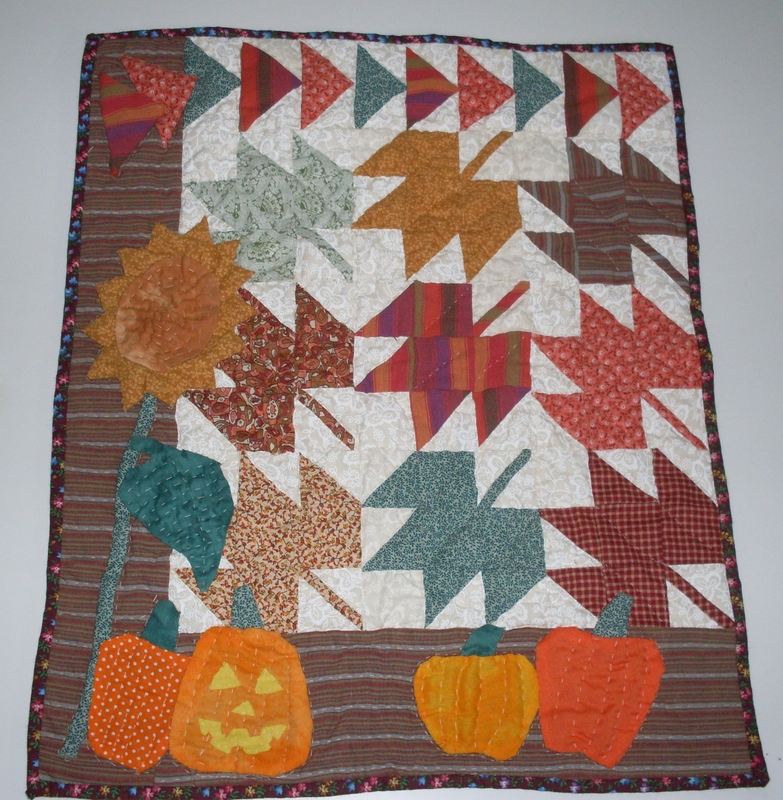 The fall themed wall quilt pictured at the beginning of this post is a project I made from “Fat-Quarter Quilting : 21 Terrific 16′ x 20″ Projects” by Lori Smith. 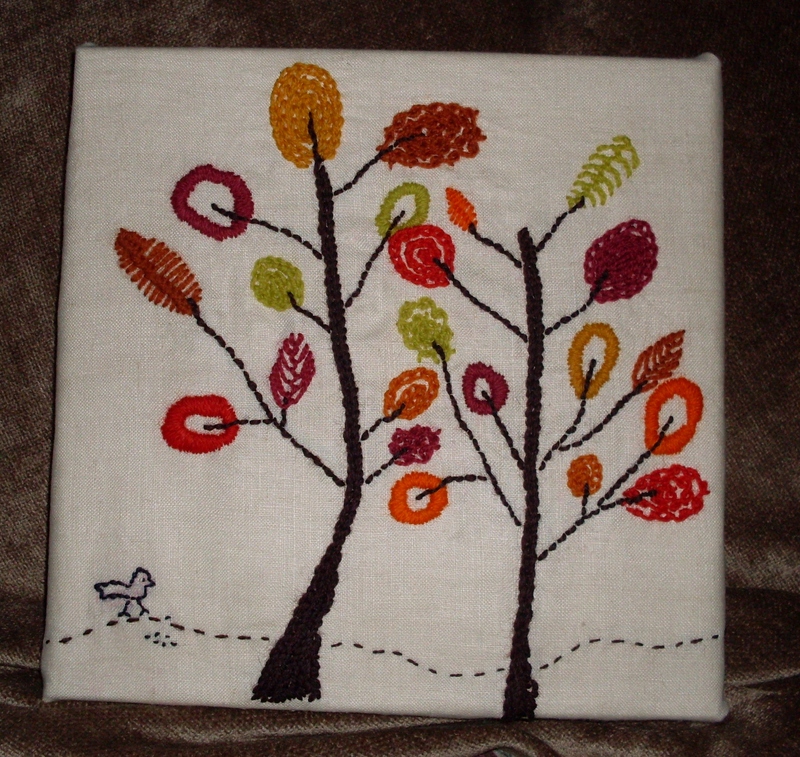 It’s called “Tumbling Leaves” and is hand quilted. My biggest challenge continues to be taking acceptable photographs. My photos are plagued by bad lighting, reflections, and blurriness. It is especially hard taking photos of myself with a tripod and timer. After a year, I finally realized I should be giving my photos a title after seeing readers were viewing “Samsung Camera Pictures” on my blog. Oops! I’m still trying to figure out how large my photographs should be, how to have better post titles, and all the technical stuff. I have enjoyed sharing my creative outlet. Writing this blog has added to my life, and I am delighted if any reader has found useful information or entertainment on these pages. A heartfelt thank you to all who have taken the time to leave words of encouragement or advice, or who stop by to read from time to time. Do you have any blogging tips, blunders, or learning experiences to share? 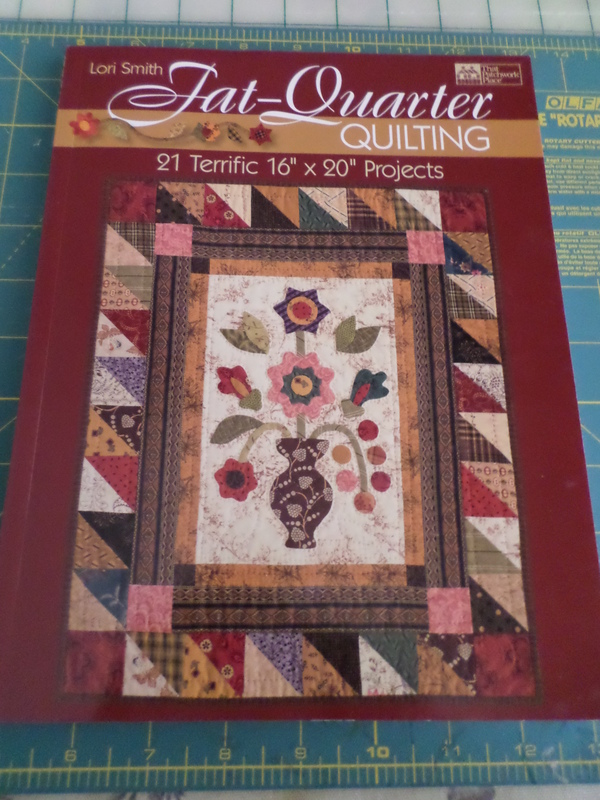 This entry was posted in Books, Embroidery, Sewing and tagged "Woolly Embroidery", blogging with Wordpress, comments on Wordpress, Fat Quarter Quilting by Lori Smith, Japanese Embroidery Book, kyuuto Japanese craft book, leaf wall quilt on November 2, 2013 by Stitch It Again.